Coffee and efficiency: both things are crucial to the success of New York City. The city has coffee shops galore, but is there a way to make the experience of getting your cup even more convenient? Enter Bustler Coffee, what owner Jamie Rogers calls a "coffee concept." He imagines a self-serve, totally customizable coffee experience, inspired by the automats of old NYC. Pop in, pour yourself a coffee from tap, add some milk from another tap, and swipe your card as you breeze back out the doors. Visually, Jamie asked that the brand reflect one of New York City's most prominent mechanisms of ease: the subway. 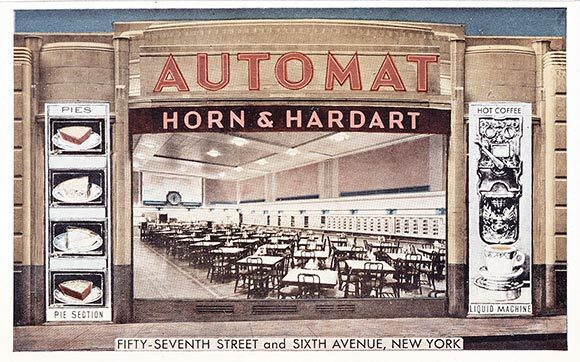 After a trip to the NYC Transit Museum (worth a visit, if you're ever in town), I decided to pull elements from the subway system and combine it with the charm of the automat era. The Library of Congress' Photo Archives is one of my favorite internet past times and totally came through for me with a wealth of references. After many rounds of sketching, I decided to go with my first idea: subway tile. It's iconic, it's easily translated into a graphic element, and it speaks to the craftsmanship and foresight of the subway's construction. But how to incorporate it without being way too literal about it? I decided to take my inspiration from the gorgeous mosaics that still live in the subway. I pulled some of the linework in, created a custom font by tracing some of the mosaic letters, and voila!